"Animals are innocent. They don't ravage the Earth. They don't hate or plot the annihilation of another species. They don't take more than they need of resources. They don't jeopardize their own survival." 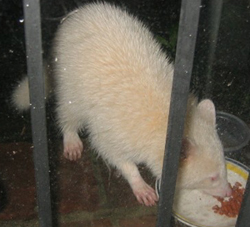 Of all the wonderful animals I have met in my backyard..I have yet to see an albino Raccoon. The next best thing is this picture of one visiting a back yard in Tennessee. in what is believed to be the first surgery of its kind in Arizona. with her husband, Bobby Ehasz. "I think they're going to be a little confused - the world as they knew it is going to be somewhat tilted." Peanut Butter and Jelly - so named because "you can't have one without the other," Ehasz said - were joined at the side of the belly near the tail end, slightly offset in a heart-shaped configuration. The two tortoises spent about half of their lives with one on its back, the other trying to kick itself over. Bobby Ehasz, 29, said he and his wife routinely flipped over the tortoises, carefully logging the time one stayed on its back while the other was upright. "This is life for them," he said. Veterinarians Jay Johnson of University Animal Hospital in Tempe and Jim Jarchow of Orange Grove Animal Hospital in Tucson worked for about three hours to separate the tortoises on Sunday. Johnson said the condition is "extremely rare." That's partly why Johnson and Jarchow agreed to operate on the animals at no charge to the Ehaszes, other than the cost for anesthesia and other items. The Tucson couple said they were aware of the risks. But they bought the tortoises a day after Christmas with the intent of having them separated. Both animals are expected to survive. And now to their delight, Peanut Butter and Jelly aren't a sandwich anymore. The Flores family of Wichita, Kansas received an early Christmas present this year when their beloved dog Bear, who had disappeared in November of 1997, made it back home in time for Thanksgiving in 2003. Jeanie Flores looked out the window of her house two days before Thanksgiving to see a dog that looked exactly like Bear standing outside. She recalls thinking, "Oh my God. I think that's my dog!" She called the dog; and he responded. Jeanie burst into tears, then called her husband Frank and told him she thought Bear was really home. Frank Flores rushed home and, after seeing the dog, agreed with his wife that the brindle lab-chow mix was indeed their Bear. One of the family's neighbors told them she had spotted Bear a little earlier, walking around and carefully scrutinizing the houses. A veterinarian who examined Bear said that although his paws were red and sore in spots, probably from pounding the pavement, he only weighed one pound less than when he disappeared. It appeared that someone had been taking care of him. Bear had disappeared in 1997 about one month after the Flores family had moved to a new neighborhood. Jeanie let him out for exercise one night, and he never came back. "I waited up all night for him, and he never came home," she said. At the time, Bear's ID tag had not yet been updated with his new address. The desperate family put up signs, canvassed their old neighborhood, ran ads in the paper, and visited shelters, but, tragically, the dog that Mr. Flores had brought home as a puppy in 1990 seemed to have disappeared without a trace. Since his extraordinary return home six years later, Bear has been catching up on his sleep and getting reacquainted with his family, which includes a son who was not yet born when the dog disappeared. The Flores family said they just wish that Bear could tell them where he's been all this time. "Where was he? We don't know how rough a life he's had," Frank Flores said. � 2003 Animal News Center, Inc.
Rescued as a kitten just prior to his being euthanized. He can only use three of his legs, but he doesn't realize he is any different from the rest. A farmer who suffered serious head injuries after being struck by a falling tree branch was rescued by a partially blind kangaroo who is being hailed as a hero. Lulu the kangaroo banged on the door of the family's home in Morwell, Gippsland in southeast Australia after discovering the farmer lying unconscious in a field. According to Rural Ambulance Victoria paramedic Eddie Wright, the man had been checking his property for damage following a severe storm when he was struck by the branch. Wright said that if Len Richards' family had not found him so quickly, he might have died. "The kangaroo alerted them to where he was and went and sat down next to him, and that's how they found him," he said. Richards was taken to an Austin hospital. Richards' daughter Celeste said, "Lulu and Dad are very close and she follows him around, but we all just love her so much." About ten years ago, the family found Lulu in the pouch of her mother who had been killed by a car. The authorities allowed them to care for Lulu and adopt her because she is missing one eye. The Australian Royal Society for the Prevention of Cruelty to Animals (RSPCA) has urged the family to nominate Lulu for its National Bravery Award. "From my point of view, it's a darn good story, and I would hope Lulu is nominated," said RSCPA president Dr. Hugh Wirth. Mocha, the six-year-old llama, broke her right front leg last spring. Owner Linda Kubiak looked out her living room window in Springport, Michigan, and noticed that Mocha was limping. Her leg was dangling. Soon, she was lying helplessly on the ground. �In order for her to eat and drink, I would have to hold her head,� Kubiak recalled. �I finally had to get a hoist in the barn. Every other day I had to lift her up to try to strengthen her leg.� Kubiak heard about veterinary surgeon David Anderson at Ohio State University, through a friend and took Mocha to see him. Anderson amputated the leg, and Richard Nitsch, office manager of American Orthopedics, a Columbus-based (US) company that manufactures artificial limbs for people, fitted her with an artificial limb. Mocha can now run through the woods and even presents her artificial leg for changing. �She is not suffering. She is happy. Mocha�s going to have a long life,� Kubiak said. Down an unmarked dirt road in a hilly corner of eastern Pennsylvania, Sankar Sastri calls out to his nine cows who, after a moment, charge around an old stone fence and romp around Sastri like children at play. "They're all happy today," the former engineering technology professor says. They have good reason to be. The cows live on Sastri's Lakshmi Cow Sanctuary, one of a scattered web of safe havens across the country protecting the animals from slaughter. "They only see them as meat," he said. "Animals have a soul, personality, they interact. Unfortunately people don't see that." Sastri's quiet, 42-acre sanctuary is also home to a tailless cat and a blind and deaf dog. When Jessica Almy recently came nose to beak with the renowned mute swan of Eel River in Plymouth, Massachusetts, the wildlife advocate for The HSUS Cape Wildlife Center immediately understood why this large bird had frightened so many unwitting boaters. Sleek and elegant, haughty and hostile, the swan's puffed-up posture and guarded demeanor was at first breathtaking to behold as he glided beside Almy's canoe, a mere inches away. But when he suddenly propelled himself forward, aggressively kicking the surface and beating his wings, Almy's admiration quickly turned to...well, to fear. Right then and there, she decided it was time to paddle back to shore. This bird would seem to have an anger management problem. An alert Watsonville, California boy used his quick wits and a large squirt gun to help rescue two small puppies that he found yelping inside a locked car in the midday heat Friday. Isaiah Ayala, 9, told his mother of the discovery, who phoned police. When Watsonville Police Sgt. Robert Montes arrived at the Menker Street incident Ayala was helping to cool the 4-week-old pups off through a one-inch crack in the window with his oversized Super Soaker squirt gun. The puppies appeared limp, their tongues dangling from the mouths and they were struggling to get out of a carton on the passenger's seat. Temperatures rose to the mid-80s at midday. The Honda Accord was left sitting in full sunlight. Montes quickly located a man near the scene who managed to summon the driver of the car. Montes ordered Israel Rivas to open the car door and the black and white puppies were rushed onto the shady lawn of the Ayala household. Ruth Ayala gave the pups a cold shower with the garden hose, and they took turns gulping water from her cupped hand. Both puppies seemed exhausted and sluggish at first but they seemed to perk up with the first aid. "You saved the day you know?" Montes asked Isaiah. "You're the hero today because these puppies wouldn't have lasted much longer." Montes guessed that the puppies may have expired within the next 10 minutes. An official from the Watsonville Animal Shelter was called to the scene who issued Rivas a citation. Rivas told Montes that he had gone into a nearby residence and had forgotten about the dogs. "What were you thinking? 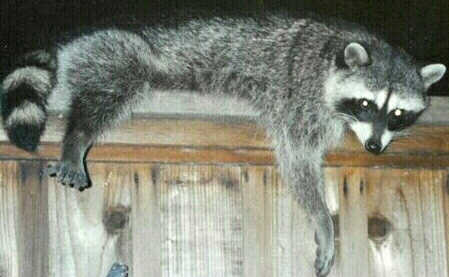 These animals were nearly killed in this heat," Montes told Rivas. Several area kids flocked to the incident and were delighted with the rescue story. They peppered Isaiah Ayala with questions. "You deserve some kind of an award," Montes told Ayala. According to Sgt. Montes, the boy will be recognized at the Watsonville, California P.D.s annual inspection in October. Israel Rivas, the man who left the pups in the car, was issued a citation and will have to stand trial for his actions. When people first meet Arbuckle they find it hard to believe he is completely blind. The one thing they do notice is how happy he seems when he is running and bucking through the field. Arbuckle has not always been so content, however, and just two years ago his situation was quite different. At the time of his arrival, Arbuckle was scared and confused. He was grossly underweight, and had not received any medical attention for his eye problems. His right eye was so swollen and sore that he rubbed is face on the walls of the barn; obviously to relieve the pain it was causing him. He had a neck chain that had not been changed since he was very young, so as he grew, it cut into his flesh. Today Arbuckle lives with the Farm Sanctuary "special needs" cows, separated from the main herd to ensure he receives the best care possible. Arbuckle is thriving and loves to spend time with his adoptive mother, Dolly, as well as all the visitors that come to the farm. ROME (Reuters) - A batch of 51 sea turtles took the wrong turning after they hatched on a moonless night and instead of heading out to sea walked into a vacationer's house. La Repubblica newspaper reported on Thursday that the tiny turtles were attracted by the house lights close to the Agrigento beach on the Mediterranean island of Sicily. The animals were collected in a bucket by the astonished resident, Andrea Crapanzano, and taken down to the sea at dawn. Marine experts said the turtles' eggs had been laid on a busy stretch of beach and were amazed they hadn't been crushed by the crowds of summer visitors. Turtles lay eggs on a number of Mediterranean islands and 2002 looks like throwing up a bumper crop of the endangered species. On the southern Italian island of Lampedusa, environmentalists say there are seven egg nests waiting to hatch which could produce more than 500 turtles. Lampedusa normally sees one or two nests a season. Seven is the biggest number since marine groups started monitoring the area 27 years ago. This is a true story. It happened this week in Murshidabad, India. Trying to scare off two monkeys that were feeding in a fruit tree, orchard owner Syed Raza shot an air gun at them, killing a female monkey. Her baby was orphaned. Reuters reports that the police did two things: They arrested the orchard owner for shooting a protected species and they hauled the baby monkey to the police station. Because the baby refused to let go of its dead mother, the two stayed overnight in the police station. The baby even attempted to suckle. The police were stumped. What could they do to separate the baby from the dead mother? They didn't have to think long. About 30 monkeys surrounded the police station, ringing the building on the ground and even climbing onto the roof. Some of the monkeys then peacefully snuck into the station--much to the officers' amusement--and carried the baby out with them. "What we saw was absolutely touching. It was as if the monkeys had made up their minds to take charge of the orphan. One of the females in the group held the baby close to her chest and offered her teats," Inspector Prabir Dutta told the newspaper Pragati. "The monkeys behaved in an exemplary fashion and impressed us with their show of solidarity. Human beings have a lot to learn from them." Two eighth-grade boys gave a duck a Mother's Day present, rescuing a dozen of her ducklings from a storm sewer. Adrian Crawford, 14, and Adam Lankford, 13, were walking home in the rain after buying Adrian's mom last-minute flowers at a drug store Sunday when they saw the agitated duck and heard chirping. They realized that its babies were trapped in the storm sewer and tried to lift the manhole cover, but it was too heavy, so they flagged down Officer Gregg Fritz to help. The three pried off the lid, and then the boys took turns lying on the ground, reaching down into the sewer to scoop up the ducklings while the other boy held his ankles. "This is a first," the officer said. "It's raining. They're shivering. But they saved those ducks. It was such a nice thing for Mother's Day. They could have walked away. But these two boys actually made a decision to make a difference, and they stayed there." With the help of the Milwaukee County Humane Society, Fritz later released the ducks in Jackson Park. Adrian's mother said the rescue made her day. "He was worried about getting me a Mother's Day present," said Kathy Bergant. "He gave me the best Mother's Day present ever given when he saved those ducks." A zoo keeper in Germany has saved a baby tapir's life by giving it mouth-to-trunk resuscitation. 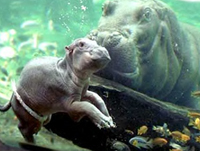 Carmina was unable to breathe after her mother Conchita gave birth at Hanover zoo. who normally works with elephants, took Carmina's trunk between his hands and resuscitated her for several minutes. Carmina is the first tapir to be born at the zoo. The keeper has been given an extra day off to celebrate his efforts. The Hannoversche Allgemeine Zeitung newspaper says that, soon after the baby tapir started breathing, she managed to drink some of her mother's milk from a bottle. She has also started taking her first steps. Zoo staff had been expecting a difficult birth because Conchita is only three-and-a-half years old. 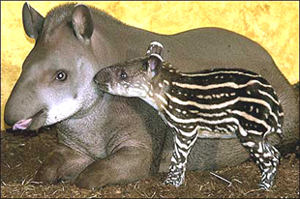 Tapirs, whose pregnancy lasts 18 months, normally do not give birth until they are four-and-a-half years old. 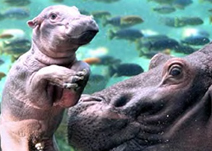 Carmina was unable to breathe after her mother Conchita gave birth at Hanover zoo. A lioness that adopted a baby oryx in the northern Kenya's Samburu Wildlife Sanctuary and protected it for 15 days before another lion killed it, continues to perplex wildlife scientists. A lioness which adopted a second baby antelope is now looking for a third to take care of after game wardens separated them. The first relationship ended after two weeks when a male member of her pride pounced on the baby oryx in Kenya's Samburu National Reserve. Wardens have now removed the second infant because they feared it wasn't getting enough to eat because its mother dare not approach the lioness. The Daily Nation reports the lioness which is called Kamuniak - the blessed one in Samburu dialect - is now stalking a herd of oryx, apparently in the hope it will get another chance to adopt. A game official said: "The lioness is still within its (the herd's) radius of operation and we expect to see it guarding another baby from the herd." The paper says wardens were also worried Kamuniak preferred to watch over the second baby rather than hunt. They tranquillised the antelope and took it to a sanctuary for feeding when she briefly strayed away at the weekend. They now intend to re-unite it with its mother. The lioness that has baffled animal behaviour experts by adopting Beisa oryx calves has disappeared from the Samburu Game plains after being separated from her fourth baby. According to game wardens, the two were separated on Friday morning after the oryx's mother took possession of her baby when the lioness went hunting. Kamuniak drew attention again on Easter this year when it adopted the Third Oryx. After several days of startling friendship, the third calf took off on its own volition. Very little is known about this species. 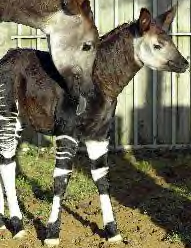 This majestic animal, related to the giraffe, is very striking in appearance, with black and white striped legs reminiscent of a zebra, and a gleaming brown velvet coat. The males have short, skin-covered horns, similar to those of the giraffe. When a family of ducklings fell down a Vancouver sewer grate their mother did what any parent would do. She got help from a passing police officer. Vancouver police officer Ray Peterson admitted he was not sure what to make of the duck that grabbed him by the pant leg while he was on foot patrol on Wednesday evening in a neighborhood near the city's downtown. "I though it was a bit goofy, so I shoved it away," Peterson told the Vancouver Sun newspaper. The mother duck persisted, grabbing Peterson's leg again when he tried to leave, and then waddling to a nearby sewer grate where she sat down and waited for him to follow and investigate. "I went up to where the duck was lying and saw eight little babies in the water below," he said. Police said they removed the heavy metal grate with the help of a tow truck and used a vegetable strainer to lift the ducklings to safety. Mother and offspring then departed for a nearby pond. A farmer and his family in India say they can't believe a tiger entered their hut in the middle of the night and just went to sleep. The tiger entered Prasun Kalita's hut in West Bengal' s Gosaba village while he and his family were sleeping. They're amazed it didn't attack them. In the morning, they left it sleeping and got help. It's now been released into the wild. The farmer was sleeping in the hut with his wife and three children, the Pragati newspaper reports. Mr Kalita says he found the tiger the next morning "sleeping like a baby". They left quietly so they didn't disturb the animal. "It's a miracle we didn't end up as dinner for the tiger. We can only thank Goddess Durga that he slept through the night and did nothing to us," the farmer said after alerting local authorities. 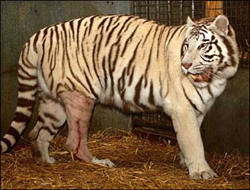 Animal experts arrived to tranquillise the tiger. They then transported it to the jungle. A forest department spokesman said: "We are happy there were no casualties. The tiger had strayed far from its natural habitat and was probably too tired to even bother about the sleeping people." An Australian man is getting postcards from his dog, which is on the run from police. Chucky the pit bull terrier was shot twice in the head by police after attacking officers during a raid. The dog survived and was taken to an animal hospital, only to be stolen by a mystery person. Police have been trying to track him down through DNA testing for 11 months. Now Chucky's owner, John Henderson, has started getting postcards from the fugitive dog. The photos show Chucky in exotic locations, WEARING SUNGLASSES and enjoying the beach, reports the Australian Daily Telegraph. Mr Henderson, who says he has no idea where the dog is and who stolen him, said: "He seems to be happy and well. I got an interstate phone call from an unknown man who said the photos would be delivered to my mailbox." Following a court case last year, council officials have agreed not to pursue Chucky if he ever returns. Tom cat kidnapped and neutered. Police have launched an investigation after a tom cat was kidnapped and castrated, they are treating the incident as criminal damage. The owner says the cat had been returning home for weeks with notes in his collar saying he should be neutered. She told the Daily Express: "Whoever did this must be sick - he is not himself anymore. I am so angry that someone had the cheek to steal him and get him doctored." A Warwickshire police spokesman said: "Our investigations are at an early stage." West Midlands Safari Park, Bewdley, Worcestershire. is limping along on good will and volunteers. There is a pecking order in domestic violence - women, a small percentage of men, then children and, at the bottom, the most helpless and least likely to talk, the animals. In Virginia, hunters chase a deer into a backyard pool and start into the yard, guns in hand, before turning to flee when neighbors approach. In Arizona, a pair of bowhunters ignore "no trespassing" signs and kill two javelina on private property, then harass and punch the property owner when he approaches them. And in Maine, hunters encroach on private property and shoot a beloved family dog, remove his reflective vest and ID collar, and leave him for dead. you will have men who will deal likewise with their fellow men..."
is expected to kill as many as 100 million animals. "The majority of Americans support the development and use of alternatives to live animal testing. Yet through the EPA�s Endocrine Disruptor Screening Program (EDSP) which threatens to test as many as 87,000 different substances, it is expected that as many as 100 million animals will suffer and die despite the fact that valid non-animal alternatives currently exist. I understand and support your agency�s efforts to protect the public and the environment from toxic chemicals, but not if millions of animals are destroyed in the process." "Vivisection is immoral. Non-human animals are not research tools. They are individuals capable of experiencing not only crude emotions like fear, but far more subtle and complex emotions such as love, grief, pride, shame, joy, and loneliness. The cognitive psychologist, Bernard Baars stated, "The basic facts have come home at last. 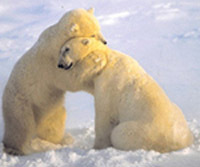 We are not the only conscious creatures on earth." WHO can benefit from this web site? Everyone interested in protecting wildlife along highways and the habitats that sustain them. Roads are the arteries of life. They get us where we want to go. They also stop animals in their tracks - often dead in their tracks. WHERE does Critter Crossings fit in? The web site describes transportation's impacts on wildlife and highlights exemplary projects and processes that are helping to reduce these impacts. By some estimates, more than a million animals are killed each day on our nation's roads. Anyone using our nation's roadways can't help but see dead wildlife. We see roadkill so often, in fact, that we tend to shrug it off as an unfortunate�but unavoidable�aspect of highway travel. It doesn't have to be, however. In April, 2001, five primates were confiscated from a Western Pennsylvania woman's home due to animal cruelty. The authorities charged the woman, Janice Ritzko with 33 animal cruelty citations. The primates were then relocated to Living Treasures Animal Park, a FOR PROFIT roadside zoo that has had numerous violations of the federal Animal Welfare Act, and who also breeds and sells animals which may end up in the exotic pet trade. 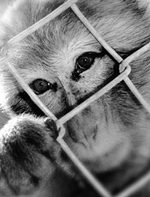 The October 2001 inspection reports from the U.S. Department of Agriculture show violations of the Animal Welfare Act directly related to the monkeys and baboon. -"There is a juvenile snow macaque that is demonstrating abnormal behaviors (Rocking, backflipping, pacing, etc.) This animal needs additional enrichments and time spent with it. A possible solution would be a careful introduction to the older snow macaque that is also alone"
"There were two snow macaques in an outdoor enclosure without shelter. There was a baboon in an outdoor enclosure with a shelter that did not provide adequate protection from the wind and weather. The open side needs to be reduced to provide him adequate protection"
On Saturday, December 15, 2001 the baboon died under suspicious circumstances at Living Treasures Animal Park. These primates have already led a very difficult life. To further exploit them for profit, as well as keep them prisoner in less than ideal conditions, is not acceptable. Accredited, environmentally enriched sanctuary homes have already been found for the animals, but have not been approved by Living Treasures. The animals' lives would be drastically improved if Living Treasures Animal Park would agree to relinquish the four remaining primates to the two sanctuaries in Texas. The snow monkey, for example, would live at the Texas Snow Monkey Sanctuary where he would be roaming in a 65 acres free-ranging enclosure with other members of his own species. The relocation would be of NO COST to Living Treasures, as several individuals and animal protection organizations have agreed to fund all costs associated with the relocation. Please write Letters To The Editor at the Tribune Review (which has been following the story) encouraging Living Treasures to relinquish the monkeys to sanctuaries and opposing the existence of roadside zoos. Subj: Primates at Living Treasures Animal Park. I am writing in reference to the five primates, (two vervets, a baboon, a squirrel monkey, and a snow monkey) who were confiscated from a Western Pennsylvania woman's home due to animal cruelty in April. I understand that these animals were relocated to the for-profit roadside zoo known as Living Treasures Animal Park. I further understand that you are following this story and I urge you to encourage Living Treasures to relinquish the monkeys to sanctuaries. Please, oppose the existence of roadside zoos. Thank you and please contact me if I can be of any help. If you are sending a form letter "as is" (not changing any words), you may want to add the following sentence to the beginning of the letter: "The following letter accurately expresses my views regarding this issue." On September 20th, the Fish and Wildlife service gave ExxonMobile the right to KILL polar bears as part of their drilling/oil exploration in Alaska. into a vast zone of industrial sprawl and pollution. Making use of storytelling,visual media and the arts to present a vision of a compassionate future. How does a construction contractor from a tough Brooklyn neighborhood become an impassioned animal activist? In the award-winning documentary THE WITNESS, Eddie Lama explains how he feared and avoided animals for most of his life, until the love of a kitten opened his heart, inspiring him to rescue abandoned animals, become a vegetarian, and ultimately, to bring his message of compassion to the streets of New York. Almost a year ago, in January 2001, Monkey Jungle announced that King was introduced to a football field size more natural environment which he would be able to access throughout the day. The zoo said his exhibit would not be open to the public until he had time to acclimate to his new surroundings. The exhibit is still not open. ARFF has alerted the Florida agency responsible for investigating the zoo to this and they have stated that although King is using the area daily, the exhibit is not open due to some hold ups with permitting. King is still alone which is extremely disturbing. Last Chance for Animals requests your help in ending the horrific abuse of dogs and other animals in Arizona laboratories. The American Heart Association has funded the following experiments: Researchers have inserted particles of glass into dogs' hearts to induce heart failure. They've also given newborn pigs brain injuries by using pendulums to strike metal shafts which had been inserted into their skills. Researchers have also implanted electrodes in lambs' hearts and heads and kept them in cages so small that they could not turn around. At the University of Arizona, the AHA has paid researchers to make incisions into the groins of live dogs, an experiment researchers classify as a "COLUMN E" experiment (LEVEL FIVE ON THE 1 THRU 5 SCALE) meaning the animals experience prolonged, unrelieved, intense pain. Please contact the Arizona Board of Regents and request that they demand an end to the American Heart Association experiments and all ~Column E~ experiments conducted at the University. "Great apes, gorillas,chimpanzees and bonobos, are being hunted to extinction for commercial bushmeat in the equatorial forests of west and central Africa. An army of 2,000 bushmeat hunters will illegally shoot and butcher over 3,000 gorillas and 4,000 chimpanzees this year. 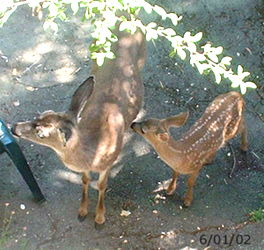 Then click on "Steve's Say", then the link "Wildlife Propaganda: The 'Sustainable Use' Lie"
She used to hang out on the fence by my back door. For several years in a row she brought her new babies to visit and they were always just as sweet as she. Sometimes she would visit in the afternoon, without the children. It was sad to watch, the babies fought all the time. Grumpy and the Trips, I remember them well. Anyway, back to Sweet Mama. Two years ago she brought five new babies to visit and two of the yearlings were still with her. Another mama with five babies also appeared. Don't know for sure who she was. Probably a daughter. Then two more that I thought were older males. The fighting! The havoc! What a crowd. I haven't seen Sweet Mama in years but maybe some day she will come back for a visit when the crowds thin out. In the meantime it's good to know that some of these visitors are the children that she taught so well. I will always remember her. She used to come in the house and play with an old pink, plush bathroom mat that I kept just for her. One morning I found it halfway out the front gate. What a sight that would have made going down the road! Evenings I would put graham crackers on the end table next to me and she would sneak in and get them, bringing the babies as soon as they were old enough to climb the front stairs. She was great fun and I looked forward to her nightly and afternoon visits. This year,a new raccoon, "Maman", made her home under my deck and five babies were born. There are cat litter boxes filled with fresh water that I refer to as "the ponds" all around the yard. Raccoons, skunks, deer, possum and red fox drink from them. The raccoons play and bathe in them also. 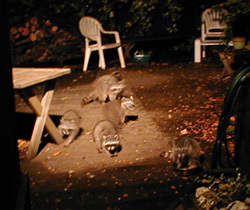 My yard at night would be very boring without the wildlife. I don't live way out in the country on 40 acres, by the way, just 20 minutes from a major city, 4 blocks from a small town, within a neighborhood, with less than a quarter acre all told. each with their own personality and story. 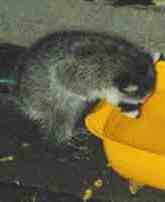 And I have never seen anything as funny as baby raccoons meeting a skunk for the first time! I love them all. And to think that it all started so innocently, with just a bird feeder and a pan of water! 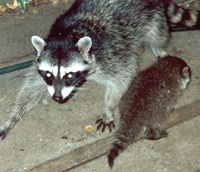 The raccoon of last season, Maman, has only 3 babies with her, plus one of last years siblings. Soon will come the saddest part of the babies lives, the time when mama must drive them away from her to make room for the new crop. I hate this part and dread it each year. This week I have met the new family twice, a small mama, about three quarters grown and FIVE babies! They were so anxious to eat and play, they ran right out in front of me while I was filling the 'ponds'. Five little fuzzy faces looking up at me and realizing I was something that was alive. They all turned and ran back under the deck, just as mama was coming out. The same thing happened the next night coming from a different direction, it's starting to get dark earlier, so mama and I must get our schedules together. 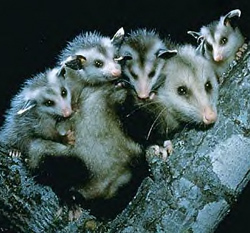 A very bad picture of mama and her 5 babies, Aug. 24, 2001. The closest one on the right ran about two feet when I came out to snap this, then came back and continued eating, this one is now called "Braveheart"
I didn't move as they sniffed my shoes and walked on by, it was all I could do not to laugh out loud! so I put out a special, shallow dish, just for him, filled with tiny puppy kibbles. I felt so sorry for him and his very young little mama, she was so nervous and frightened and he never left her side. It was a very cold winter and the thought of only those two keeping each other warm was so sad. But they survived and came by nightly, always nervous and afraid and not at all social. he was choking and running back and forth with strings of saliva hanging from his mouth. all I could think was "Please, oh please, not the little nub!" with lots of territory to cover. How would I catch and restrain the Nub for hours until they got here? not until 9:00 am. What good would it do him to be in a cage for 12 hours? many, many miles and a highway away from his home and mom. Several weeks later I heard a choking sound, outside, a Mama Raccoon had something stuck in her throat. which is to give them a small blob of butter. Hmm, how am I going to do this? Certainly not by sticking my finger, with the butter on the end of it, into the raccoons mouth! It wouldn't have been a problem to get her to open her mouth, she would do that just as soon as I grabbed her! I ended up putting a blob of butter down on the deck and spent the next few minutes trying to chase the babies away from it...eventually I had to let nature take it's course. I crossed my fingers and went inside.